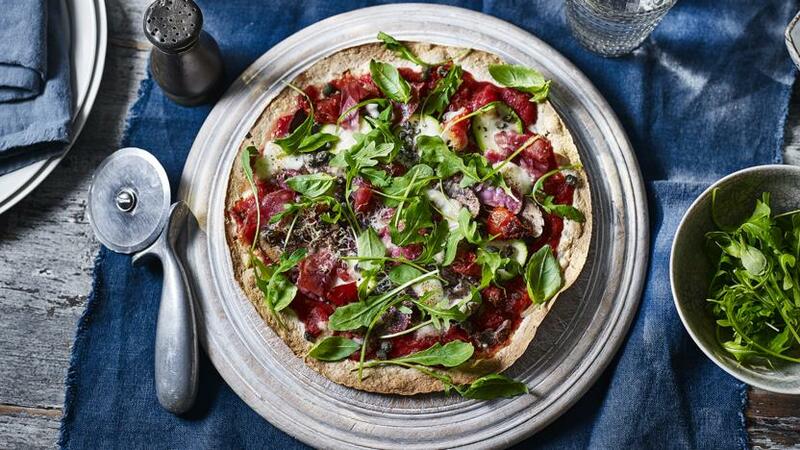 What a brilliant idea – baking tortillas to use as pizza bases. A quick and easy supper on the table in less than half an hour. Result. Each serving provides 440 kcal, 28g protein, 41g carbohydrates (of which 9g sugars), 19.5g fat (of which 7g saturates), 8g fibre and 3.4g salt. Place the tortillas on two baking trays and bake for 5 minutes, or until crisp, but not coloured. Remove the tortillas from the oven and increase the oven temperature to 200C/180C Fan/Gas 6. Mix together the tinned tomatoes, tomato purée, oregano and garlic. Season to taste and stir well. Spread half of the tomato mixture evenly over each tortilla, leaving a 1cm/½in margin. Divide the toppings between the tortillas, finishing with the mozzarella and a final scattering of Parmesan. Bake for 10–12 minutes, or until the cheese has melted and started to turn golden-brown. Cut the pizzas into wedges and scatter over the basil and rocket leaves to serve.